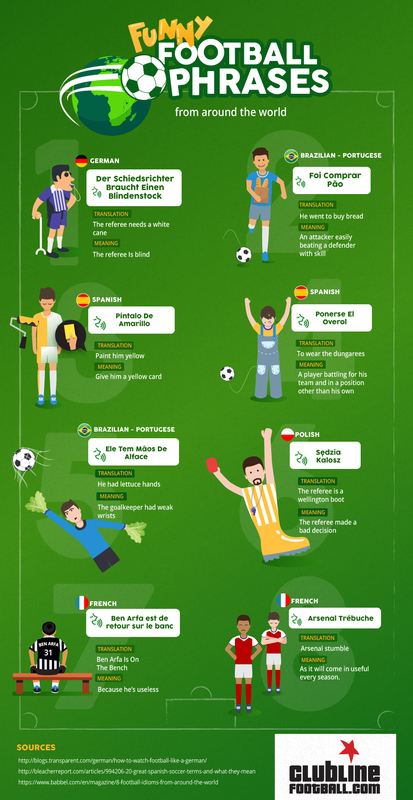 We have some very odd Football phrases here in the UK, the good ol’ “six-pointer” or the ball going into “row z”, but what weird football phrases do other countries have and how would we say some of our common phrases in their language? Well we’ve come up with an infographic highlighting just that. So, take a look at our latest piece entitled “Funny Football Phrases”. <a href=https://clublinefootball.com/blog/funny-football-phrases-from-around-the-world/><img src=https://clublinefootball.com/wp/wp-content/uploads/2017/05/5.jpg alt=”Funny Football Phrases From Around The World” width=450 /></a><br /><a href=https://clublinefootball.com/blog/funny-football-phrases-from-around-the-world/a>Funny Football Phrases From Around The World</a> by <a href=http://clublinefootball.com>Clubline Football</a>. <a href=https://clublinefootball.com/blog/funny-football-phrases-from-around-the-world/><img src=https://clublinefootball.com/wp/wp-content/uploads/2017/05/5.jpg alt=”Funny Football Phrases From Around The World” width=955 /></a><br /><a href=https://clublinefootball.com/blog/funny-football-phrases-from-around-the-world/>Funny Football Phrases From Around The World</a> by <a href=http://clublinefootball.com>Clubline Football</a>.